We're making a difference in the world of cats. We help people be proud of their love for cats, while providing for shelter cats in need. 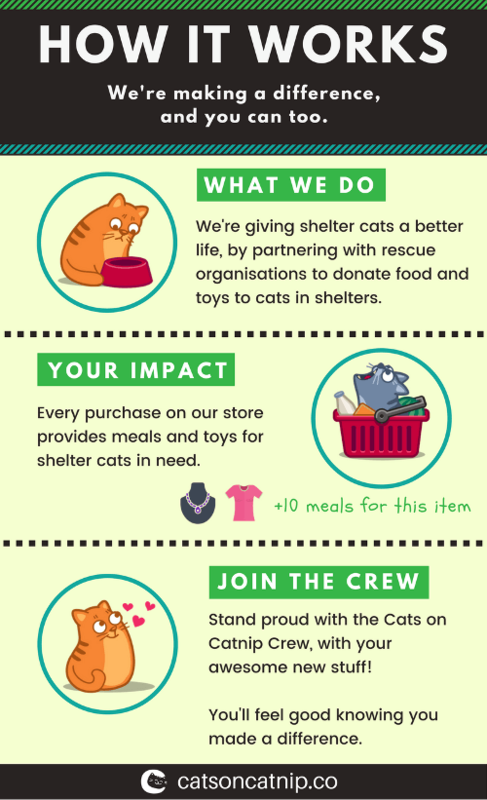 Each product on our store tells you exactly how many cats you are feeding and helping. We donate through Rescue Bank, a program of GreaterGood.org, or to shelters directly through our social program. We're HUGE believers in the "Adopt, don't shop" philosophy. That's why we're pushing to make a difference. You can make a difference too..
Love cats? You'll absolutely love the unique range of apparel and accessories we have! Whether it's providing meals to shelter cats, or new toys to play with, you'll feel good knowing you made a difference. Want to get in contact with us? Simply fill in the form below.